Things I would have changed: Make the skirt a little thicker, or take better care in packaging. What others should know: These round's are at parr with Kovohute Standard's, great Plinking/Pesting round. Things I liked: Bought these in the Gamo Combo 4 pack. Volume-wise, I think they're a great value. However, they don't group well in my Benjiman 392. They do a little better in my Crosman Backpacker. Things I would have changed: -Consistency in size. Some fit loose and others are super tight. -Also, clean them up. They are very dirty and have lots of bits hanging off of them from manufacturing. What others should know: -The skirts are a tad long and pinch when pushing the bolt in. I'm pretty sure this is one of the reasons I'm getting poor accuracy. -I think they just don't like Crosman guns. Things I liked: Well, they were the cheapest pellets available. Things I would have changed: Quality control. Several pellets had larger heads and were difficult to get into the breach. Also, several were miscast and had cuts and protrusions on.them. What others should know: I.will use these up, but no more Gamo pellets for me, looking for quality at any price, and these lacked in that area. Things I would have changed: Maybe a lighter pellet. It didn't perform on small game as well as I hoped, from my Nitro Piston. Maybe they do better from a PCP? Things I would have changed: More strict control of head size. What others should know: I was surprised with the tin I received. The pellets were clean and without deformities.I read so many bad reviews but I wanted to give them a try on my rifles.They shoot well on my Benji NP2 and Hatsan stryker 1000s up to 75 feet,over that the accuracy decreased.The only problem I found is that about 20-30% of them have bigger heads and don't enter on the barrel easily.You can force them with a tool but those were fliers.The others that fit well shoot accurately. Things I liked: This was the only can from gamo that stayed shut. Things I would have changed: Packing technique. What others should know: Machine dropped into tin. I had 43 pellets I could not shoot. Half of them, the heads were to dented to fit in. The rest had skirts so squashed they looked more like lead balls. Things I liked: They don't look real pretty but they perform. I can't dispute the results of a penny size group on the target at 35yds, and I'm just a so-so shot with a springer. Things I would have changed: Nothing, don't mess with success. What others should know: Shooting a Gamo Bull Whisper Extreme in 22, 7lbs 10oz with a 6X scope doing 19ftlbs energy. Tried over a dozen of the most common 'go to' pellets for accuracy and performance. This one worked in this rifle. Also JSB RS and Predator PolyMag were very accurate. Each type of pellet grouped to a different POI, so the scope has to be reset for the pellet to be used. Perfect hunting rig for my 50yd limit. Great medium weight pellet. Things I liked: Accurate, inexpensive, nice weight. These pelletts are pretty darn nice and wow are they inexpensive. Good job Gammo, quality and affordability. What others should know: I have been useing these to break in my Benjamin NP Limited edition, they seem fine, and accurate. I have used other Gamo pelletts in the past and have always like the quality, and inovation. Things I liked: The tin has a screw on lid. What others should know: These are the worst lead pellets I have ever seen, and sight unseen I bought two tins of them. Darn!!! 50% of these pellets are so deformed that I can't shoot them. I mean they are really bad. Gamo is goint to be hearing from me. I avoided these Gamo pellets like the plague, that was a big mistake.. I tried the Gamo .22 Magnums and they didn't work for me. But these .22 Gamo Hunter pellets were just as good as the JSB pellets I have been buying.. My Hatsan was sighted in with JSB's and with no changes to the scope or my open sights these shot just as tight at 90 feet.. I have a lot of JSB's on hand but I will be buying these because they are cheap and shoot very well.. I think a person has to use what he thinks is the most cool, but to me paying 4.99 a can for these in town and getting that kind of performance is really cool.. It seems to me that if your gun doesn't shoot them well that doesn't mean they are crappy.. I'm glad I picked up a can they worked great for me and I didn't really cool.. I didn't see anymore deformed pellets in this tin I just shot than I have in the top shelf JSBs.. I personally like the JSBs but I will be stocking up on these too..
Don,t waist your time talking to Gamo. I spent $12.95 of my own money to ship pellets back to gamo in Houston Missouri to be tested and all they did was say the chambers must be bad in all three of my guns. Things I liked: These are the first pellets I am shooting in my first air gun. Seem pretty accurate and I was able to sight in my new gun in about 15 shots. Nice groupings at both 15 and 20 yards. What others should know: Worked well in my Gamo Silent Stalker. When the weather warms up I will continue fine tuning the scope. One shot on a bunny at about 25 yards and dinner was ready. Things I would have changed: improve manufacturing tolerances and create a better product. What others should know: The best group I can get from these is 1.2 inch at 10 yards from my springer rifle on a bench rest. These are junk. Things I liked: The packaging, as usual is superb by PA. Great customer service and fast, economical shipping make PyramydAir my #1 choice. Things I would have changed: These pellets are absolutely awful. There is no consistency pellet to pellet and there is slag leftover from manufacturing stuck to the pellets. What others should know: These are a waste of money in my opinion. Pyramyd has a wide selection of good pellets. Spend the money on good pellets and you come out better in the long run. Things I liked: to be honest, i was actually quite suprised. i found these, out of 3 different gamo .22's, to be the most accurate in my titan gp. i was shooting at 10 yards. i got 1/2" groups. that is what i need for my starling bait hunt. Things I would have changed: the quality of the pellets. they were very rough looking, and had seams coming out the sides. and the end of it is crappy looking and a little marked up. What others should know: find the best pellet for your gun and you should have the accuracy for hunting and target shooting. Things I liked: I thought and think this is a great pellet. It hits hard, my gun shoots it acuratly. I use a Beeman R1 combo with the 177cal, and the 22 cal barrels. I do see a diffrence in the style of this one compared to the 177 style. the 177 seems to hug the barrel better in the front of the pellet. but none the less I don't see any difference in shot placement or power. Good Pellet, for My Gun. Things I would have changed: Nothing, except maybe the front of the pellet a little tighter fit into the barrel. Things I liked: Absolutely nothing. Things I would have changed: Go back to the old pellet design. The new design is crap. 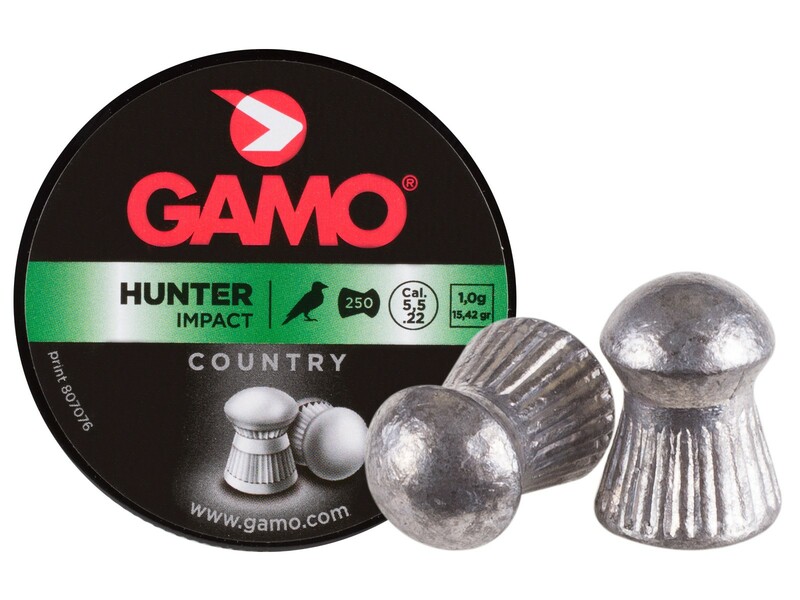 What others should know: Gamo Hunter pellets have for many years been my favorite pellet for most air guns I own. They've always been a little dirty, but worked great. Now Gamo has pulled a slick one. They changed the design of the hunter pellets(at least in .22 cal. )from a good pellet to pure crap. There not uniformly shaped, they appear to be made in two part mold and have casting lines. A few in the last tin I got looked like they had wings. They remind me of some cheap Chinese pellets I once bought at a flea market, and shoot about as well. Accuracy while not horrible is very disappointing. So now I have to start looking for a new favorite pellet. Thanks allot Gamo. MIKE,,I FOUND THE SAME THING HAPPENING,,i DID NOTICE THAT THE TIN'S WITH THE NEW LABELS HAVE CONSIDERABLY BETTER q/c THAN THE OLD DESIGN, HOPE THIS HELPS, ANDY.